One of my favorite holiday traditions is counting down the days to Christmas by way of my trusty Advent Calendar. I’m not a big fan of the store bought calendars because usually the chocolate tastes like dirt (and aren’t really chocolate). Instead, I hang up little gift bags and fill them with a tastier treat, one each for my boyfriend and I. Some day I’d like to make a more permanent calendar, but until then I’m enjoy the one I have! Recently, I thought why can’t my dogs celebrate the season of Advent as well? Of course they can’t eat chocolate, but they are a part of my family, get Christmas presents, and participate in all our other Christmas festivities. I don’t see a reason why they can’t celebrate this way too! In case you didn’t know – Advent itself is a season of waiting (and preparing) for the celebration of the birth of Jesus (on Christmas Day). It is observed by many Christian churches and starts on the fourth Sunday before Christmas (also known as Advent Sunday). That means that this year (2017) Advent technically starts on December 3, so this post isn’t actually behind schedule yet. YAY for me! Many commercial and reusable calendars start on December 1 because the start of Advent can range from November 27 to December 3, so it logically falls in the middle. In other words, if you have already started your Advent Calendar don’t worry! You aren’t doing it wrong at all. 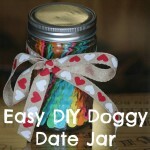 But if not, you still have time to pick one up or create one for you and your pups. And, if you are reading this in a few days and missed the official start of Advent by a day or two I won’t blame you either. This is a busy time! I’m doing good putting my shoes on the right feet this time of year. When you are picking out your ribbons, make sure that they compliment each other. 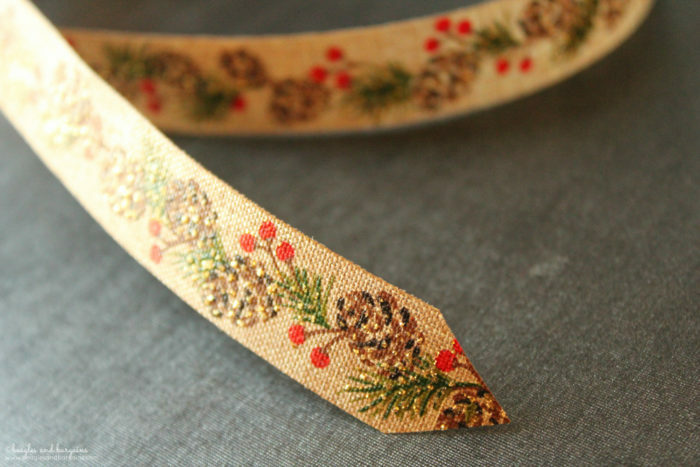 This time of year, check your local craft stores like Michaels as they frequently have great sales on holiday ribbon. I bought all mine at 70% off + an extra 25% off! It was a great deal and allowed me to make two different Advent Calendars – one for Ralph & Luna each. I initially tried to do this project with a mini stapler since I’m currently traveling and living out of a hotel room. It DID NOT work at all. 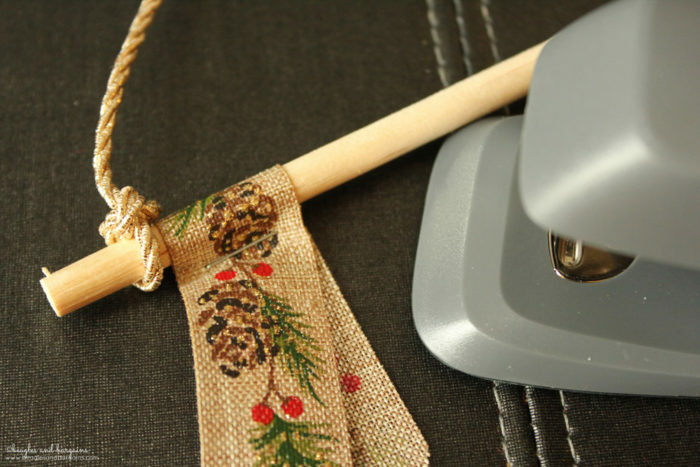 To get the staples straight, you have to have somewhere to put the excess ribbon, so a tiny stapler just won’t do. Luckily, I’m staying right by a Target and was able to pick up this super inexpensive full size Swingline Stapler Value Pack. It was only $5.99 and it made all the difference. For treats, I used a mix of small and larger treats. For the smaller treats, I selected Wellness’s seasonal Gingerbread Crunchy WellBars and Blue Dog Bakery Biscuits were the bigger treats. The big prize for Christmas day is a WHIMZEES Veggie Sausage. You could also use a bully stick, other larger chew, or even a new toy! There are about 20 steps to complete this project. It seems like a lot, but I’ve really just broken down each and every step. This project is super fun and little time consuming, but the individual steps are easy and don’t require any sewing at all. If there is anything that is confusing, please leave a comment below and I’ll be happy to clear the instructions right up! Happy Crafting! 1. 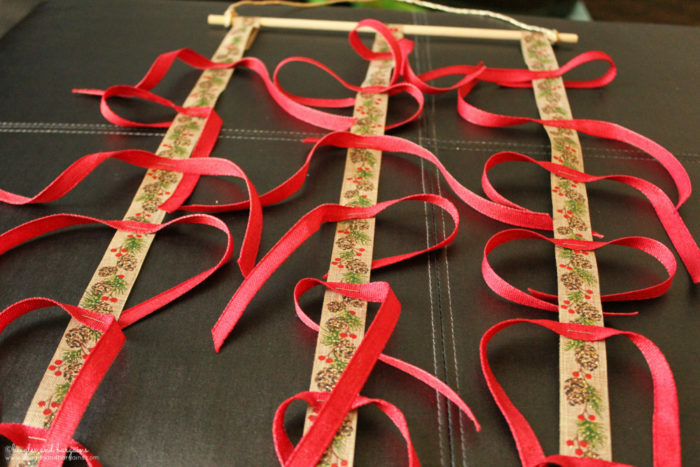 Cut three (3) 30″ pieces of the 7/8″ ribbon (RIBBON A). These will be the ribbon pieces that hang down from the wood dowel rod and make up the main structure of the Advent Calendar. Cut them at a slight angle to stop fraying. 2. Trim one end of each piece of ribbon from #1 into a triangle. This looks a bit more stylish and will help keep the ribbon from fraying. You can also apply Fray Check or even a clear glue to the end to keep it from fraying. 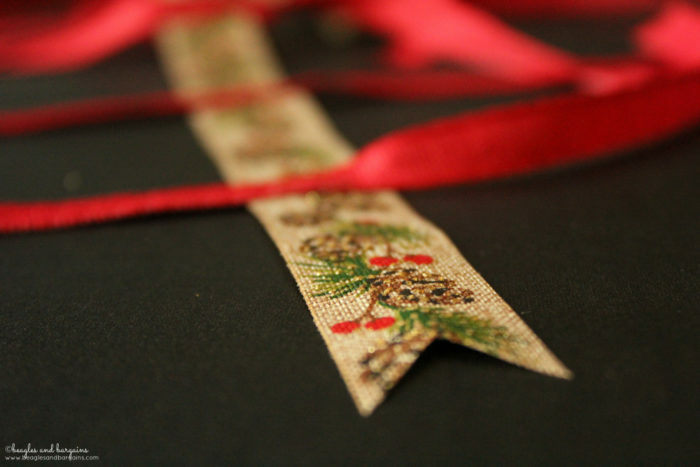 If your ribbon has a directional pattern, you will want to cut the triangle on the top end of the ribbon. 3. Fold over the end you cut in #2. You want about 2″ of the ribbon folded over. 4. Staple the ribbon from #3 about 0.25″ down from the top. This will form a loop that the wood dowel rod will slip through. Make sure your dowel will fit by doing a quick test before proceeding. If it doesn’t, carefully remove the first staple and try again. 5. Repeat #3 and #4 for the other two pieces of 7/8″ ribbon (RIBBON A). Now you have the basic structure for your Advent Calendar! 6. 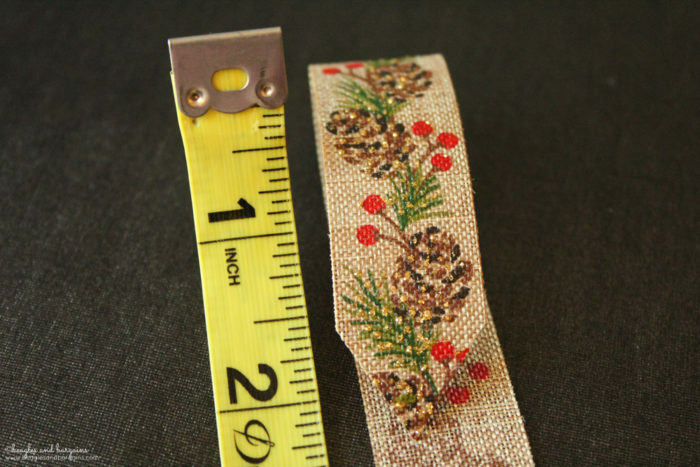 Cut 24 pieces of the 3/8″ ribbon (RIBBON B) measuring 12″ long each. These pieces will be the ribbon that will attach the dog treats to your dog’s Advent Calendar. If you are using larger (or smaller) treats, you may need to adjust the size of these ribbon pieces slightly. Just like in #1, cut these at an angle to prevent fraying. You can also try Fray Check. 7. Line up your measuring tape at the top of a ribbon from #4 (RIBBON A). 8. Staple one piece of the ribbon from #6 (RIBBON B) perpendicularly onto the ribbon from #4 (RIBBON A) every 3″ starting at inch 3. You should have a stapled piece of RIBBON B at 3″, 6″, 9″, 12″, 15″, 18″, 21″, and 24″. 9. Repeat #8 for a second piece of ribbon from #4 (RIBBON A). 10. Repeat #8 for the third and last piece of ribbon from #4 (RIBBON A), except start at inch 2. 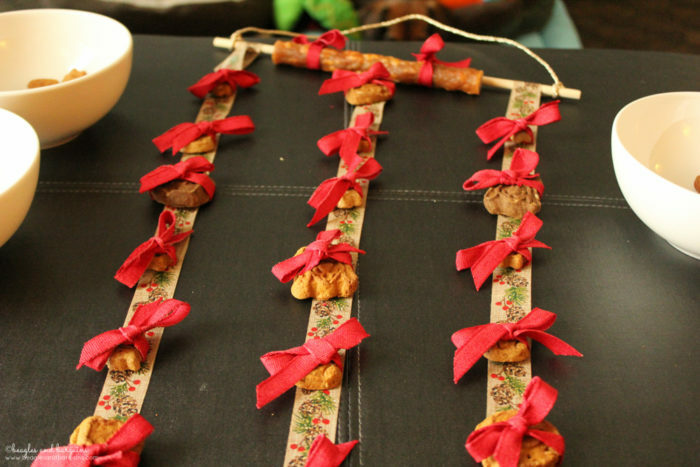 This will be the middle ribbon once hung and will allow the treats to alternate height. 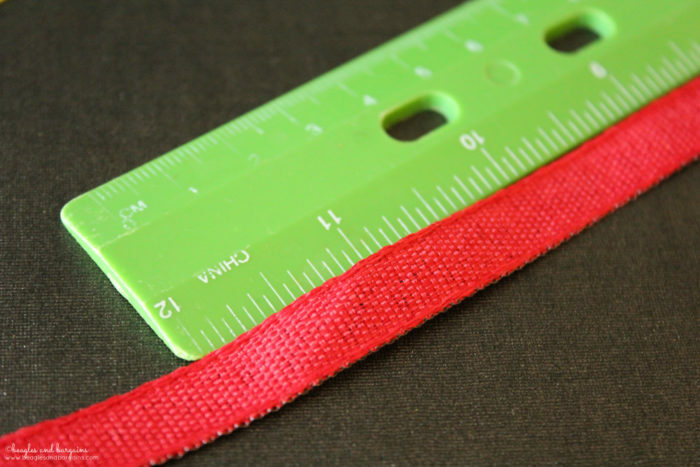 You should have a stapled piece of RIBBON B at 2″, 5″, 8″, 11″, 14″, 17″, 20″, and 23″. 11. 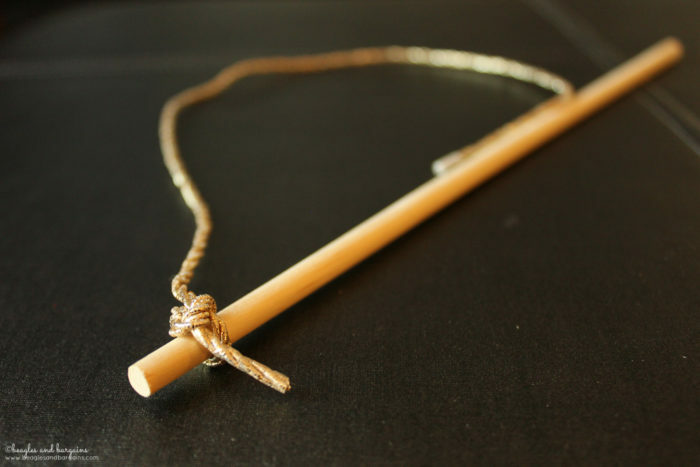 Slip the wood dowel rod through your ribbon from #8, then #10, then #9. Evenly space them out along the dowel. 12. 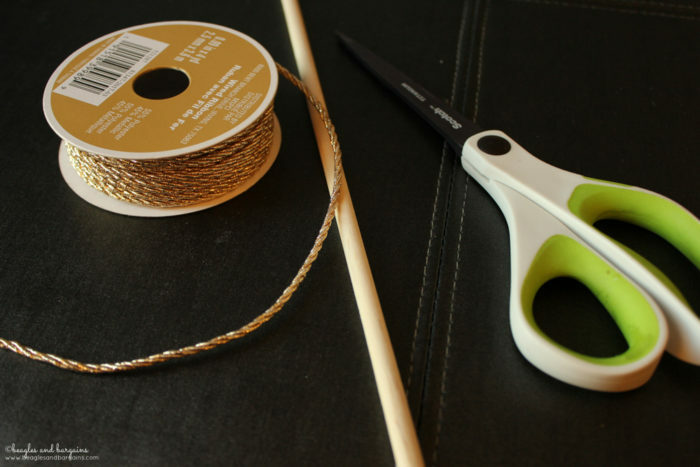 Cut a 24″ (2 feet) long piece of your twine or thin ribbon wire (RIBBON C). 13. 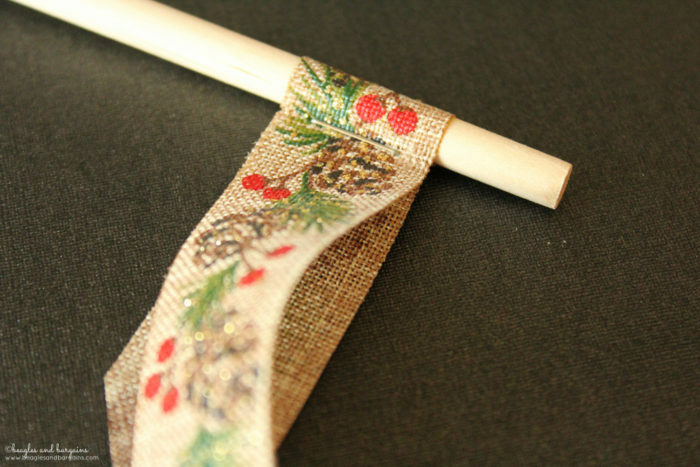 Tie your ribbon from #12 to each end of the wooden dowel. This will be the hanger for the entire Advent Calendar. If your wire ribbon or twine start to unravel, you can use a piece of clear tape or a bit of glue to hold the ends together. 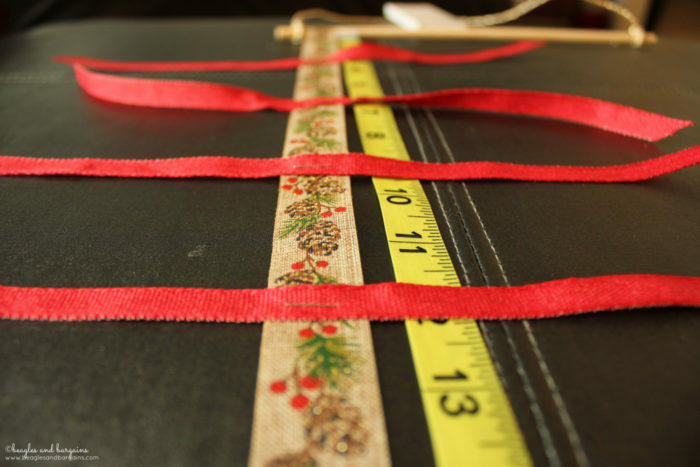 Adjust the length of the ribbon to accommodate your height needs. You’ll want to keep the calendar up high. Your dog may learn that it has treats on it and if he or she were to get their paws on it, they may try to hurry the Advent season along by eating all the treats in one sitting. 14. 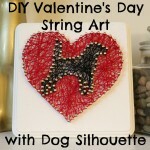 Secure the hanger from #13 with a bit of hot glue at each end. Glue a circle of hot glue around the rod near each end. This will keep the hanger ribbon from falling off the ends. 15. 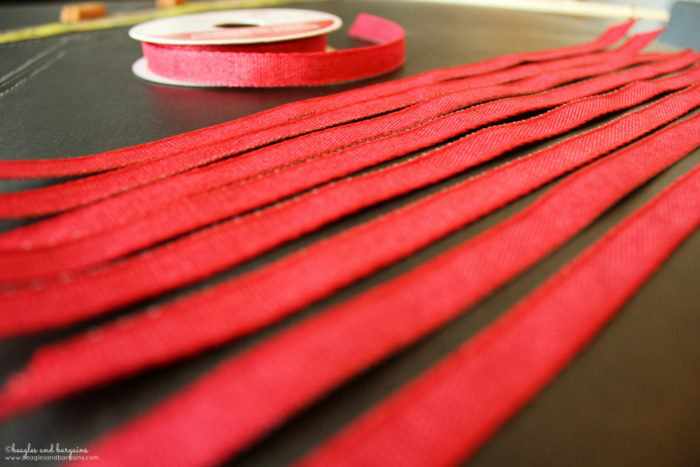 Cut two pieces of the 3/8″ ribbon (RIBBON B) about 15″ long. These pieces will tie on your larger Christmas Day treat, so they’ll need to be a bit longer than the rest. Adjust the length if you have a larger or smaller treat. Just make sure it keeps it attached until December 25. 16. 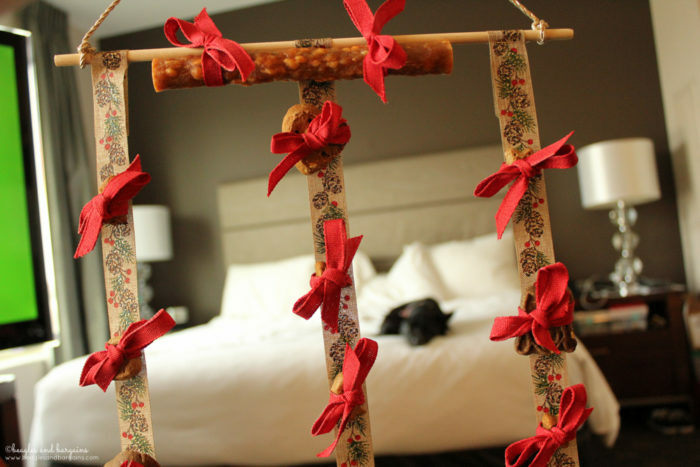 Tie your dog’s big Christmas Day treat onto the dowel rod with the ribbon from #15. 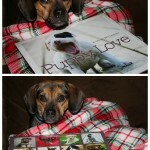 Make sure it’s extra secure since your pup will probably be drooling for it all December long. Attaching this first will also help weigh down the entire calendar while you attach the rest of the treats (see next step). 17. 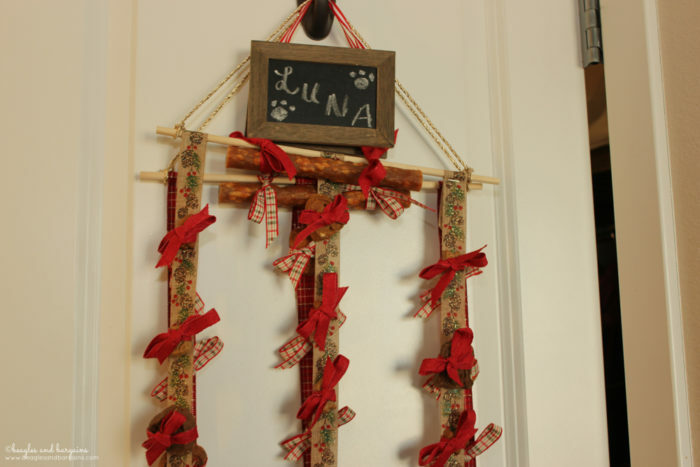 Tie a smaller dog treat to each of the ribbon pieces from #8-10. You should have 24 treats in total. I alternated a larger treat with the smaller ones every 3 treats. 18. Trim the ends of the ribbon from #11. I like to cut a V-shape to add a little pizzazz! Doing this at the end will ensure all your ribbons will be equally as long. And again, the angles will help with fraying. 19. 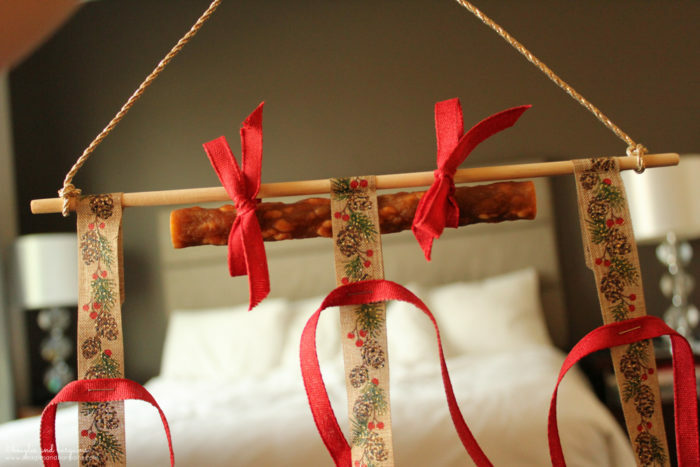 (OPTIONAL) Make (or buy) a big bow and attach it to the wire or dowel. 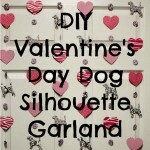 Instead of doing this, I picked up some cute mini chalkboards from the Target Dollar Spot. They were 2 for $3, so I couldn’t pass them up! I wrote one of my dog’s names of each of the chalkboards and hang it up with the Advent Calendar. 20. Hang it up! You did it! That’s it. 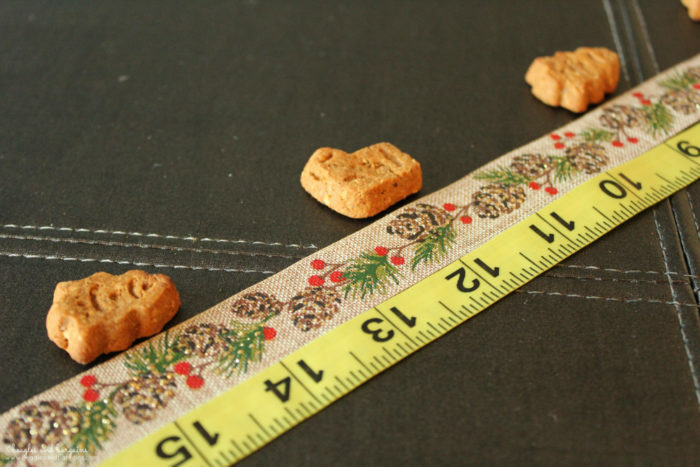 Now it’s up to you to remember to give your dog their special treat this Advent season. If you don’t have a good place to hang your dog’s Advent Calendar, I recommend picking up some Command Hooks. They are relatively inexpensive and you can find them pretty much anywhere (like Target or Amazon). Plus, you can take them down when the season is over and they don’t leave a hole in the wall! I recommend serving these treats to your dog from the bottom up. We start at the bottom left and move right across the Advent Calendar, then up one level. It will help keep everything balanced and further away from hungry dogs. You could also try just taking treats at random and making it a fun Jenga-like game! For multiple dogs, you could put treats in a small plastic jewelry bag and tie that on instead of the treat itself. 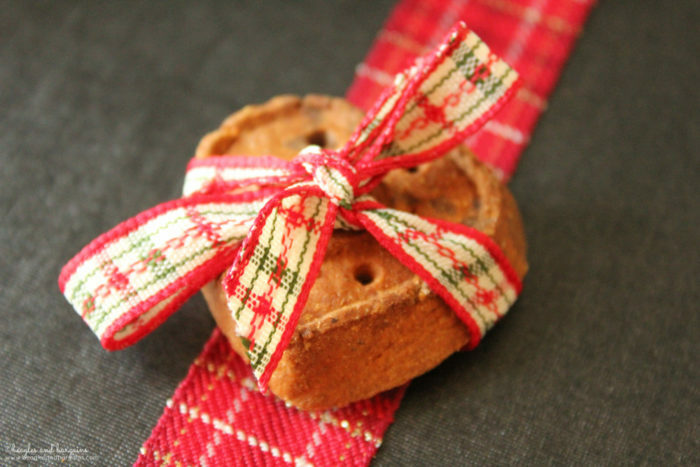 You could also just tie more treats on individually or make multiple whole advent calendars. That’s what we did, so Ralph & Luna each got their own with ribbons that fit their personalities! If you would rather make the Advent Calendar more permanent, you could always sew the ribbons on instead of stapling them. 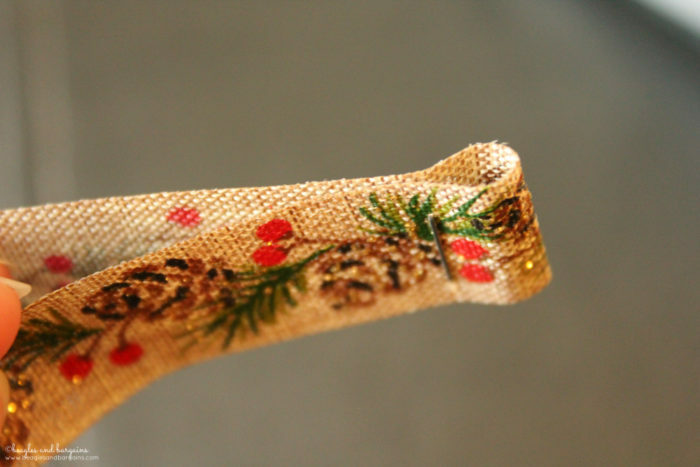 You could even use snaps or velcro to attach all the ribbon. As long as you are gentle, the staples should allow you to get a few years out of the calendar, so you don’t have to make an all new one next year. You might need to repair a staple or two, but that’s super easy! 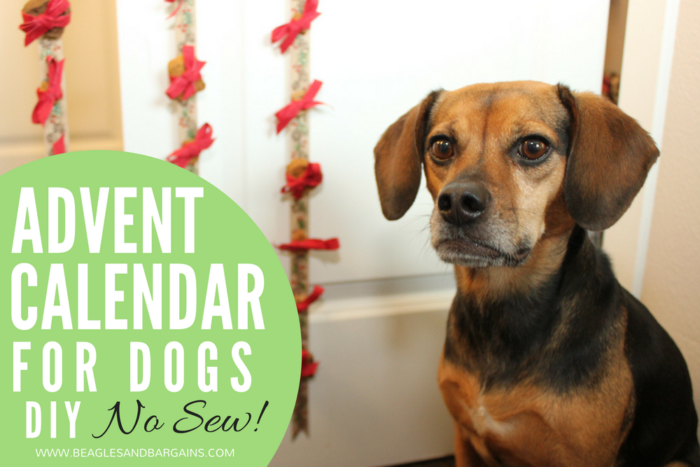 If you’ve made your dog an Advent Calendar, share a picture in the comments below! We’d love to see it. Want to save this tutorial for the future? 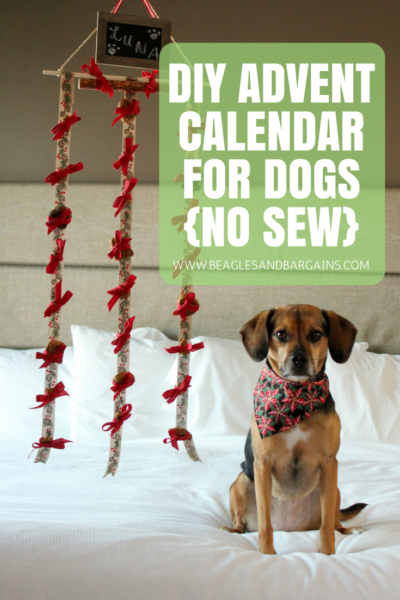 Save “DIY Advent Calendar for Dogs” by pinning the image below on Pinterest! Disclaimer: Affiliate links are used in this post and I may receive a commission if you click and/or purchase from the link to help support this blog. Do not worry, these links do not affect the price of products. I received no additional benefits for mentioning the products in this post. The opinions and ideas in this post are my own and are uninfluenced by any other person or business.